Background: Birth asphyxia is a leading cause of death in neonates and long-term neurodevelopmental disability in children. Identification of risk factors and implementing adequate obstetric care could help prevent its occurrence, thus averting the psychosocial and economic burden of the disease on family and society. Materials and Methods: This 5-year longitudinal study enrolled newborns admitted for birth asphyxia in the Neonatal Intensive Care Unit (NICU) of the Enugu State University Teaching Hospital and followed them up until discharge or death. Multi-level regression analysis was used to determine the factors that predicted the outcome in the admitted newborn. Results: Two thousand four hundred and fifty newborns were admitted into the NICU during the study period, and 180 were managed for birth asphyxia which resulted to an in-hospital incidence rate of 73.5 per 1000 admitted newborns (95% confidence interval 63.1—84.2). The mean age at presentation was 1.51 ± 1.59 days and mean birth weight at admission was 3.05 ± 0.67 kg. There was no significant difference in the mean age at presentation (T = 0.412, P = 0.681) and weight at admission (T = 1.295, P = 0.197) between neonates who survived and those who did not. Significant predictive association was seen between management outcome and maternal and neonate socio-demographic parameters such as gestational age at birth (P = 0.020), maternal occupation (P = 0.041), place of birth (P = 0.020), and asphyxiation score at presentation (P = 0.024). Prolonged labor (45.6%), obstructed labor (10.4%), and prematurity (8.0%) were the most common causes of asphyxiation encountered in surveyed neonates. No cause was obvious in 12% of cases. Conclusion: The incidence of birth asphyxia is unacceptably high in our setting. Practical and hands-on measures to control modifiable risk factors and prevention of causes identified in this study need to be sustained to reduce neonatal mortality and morbidity associated with birth asphyxia in resource-limited settings like ours. Birth asphyxia or perinatal asphyxia is defined as the failure to establish spontaneous breathing at birth. It is a major cause of mortality and morbidity in neonates. Birth asphyxia is one of the biggest contributors of death in newborns only after pneumonia, diarrhea, sepsis, and prematurity causing a stunning one million newborn deaths each year with over 90% of these deaths in Africa. Globally, neonatal mortality accounts for 40% of all under-5 mortality, and in Africa, it is documented that of every four child who dies, at least one dies before their first 30 days of life. While under-5 mortality rate has on average declined in many African countries, neonatal mortality rate has shown little or no progress. Apart from fatalities, birth asphyxia is also a known cause of long-term morbidities. Due to the catastrophic effect of hypoxia on the developing brain, some neonates who survive birth asphyxia are left with neurodevelopmental disabilities such as mental retardation, cerebral palsy, and learning disabilities. These lead to a prolonged healthcare burden that adds strain to the already fragile resource-limited healthcare system in most African countries. It is estimated that the burden of disability-adjusted life years caused by birth asphyxia alone exceeds those of most neonatal illness combined. For any meaningful progress to be made in reducing neonatal mortality rate, programs that prevent perinatal morbidity and strengthen maternal-newborn care services are expedient. It is therefore imperative that the risk factors that predispose to neonatal morbidities and mortalities are continually evaluated especially in developing countries where facilities to effectively manage these neonates are deficient. We surveyed the newborns admitted for birth asphyxia in the Enugu State University Teaching Hospital (ESUTH) over a 5-year period and evaluated neonatal, maternal, and obstetric factors that predict mortality. This study is the second part of a survey carried out in the Neonatal Intensive Care Unit (NICU) of ESUTH, Parklane. The study site and facilities present for the management of asphyxiated newborns have already been documented in the first part of the published article. This longitudinal study was carried out over a period of 5 years (January 2013—January 2018). Newborns of consenting mothers delivered in ESUTH or referred to it that failed to establish spontaneous respiration following birth were enrolled. The management outline of newborns with birth asphyxia has been described in a previous study in the same study site. For this present study, the SARNAT Scoring Scale was used to assess the newborns admitted for birth asphyxia. This is a classification scale used to assess the degree of hypoxic-ischemic encephalopathy (HIE) in newborns based on clinical presentation and physical examination findings. It categorizes asphyxiated newborns into three stages of HIE. [Table 1] shows a summary of the scale and stages of classification. For babies delivered outside the study setting, follow-up enquires were made to the place of birth. In few cases where this is not feasible, assessment was made by history taking of events around birth. For every neonate enrolled, newborn, maternal, and obstetrics variables were documented and classified as follows: (a) newborn variables: age of patient at presentation: <24 h, 24—72 h, and >72 h of life; gender: male and female; gestational age at delivery: term (≥37 weeks) and preterm (<37 weeks); birth weight at delivery: <2.5 kg, 2.5—4 kg, and >4.0 kg. (b) Maternal variables: maternal educational attainment: <6 years, 7—12 years, and >12 years; maternal occupation: unskilled (i.e., petty traders, artisans, small-scale farmers), semi-skilled (i.e., middle-level bureaucrats, technicians, skilled artisans, and well-to-do traders) and skilled (i.e., professionals, top civil servants, business executives, and politicians); socioeconomic status: low, middle, and high (based on paternal occupation and maternal education). (c) Obstetric variables: antenatal care (ANC) service uptake: yes and no; place of birth: ESUTH, maternity home, and home and/or traditional birth attendant (TBA) mode of delivery: spontaneous vertex delivery, elective and emergency cesarean section. The above measures were documented at presentation in the relevant sections of the questionnaire and subsequently transferred into a Microsoft Excel Sheet. Distribution of the measures of both socio-demographic measures (predictor variable) and management outcome of newborns was analyzed and reported in percentages. The Chi-square analysis was used to assess initial associations between predictor and outcome variables. Multivariate logistic regression analysis was used to determine socio-demographic parameters considered in this study that were significant in predicting management outcome of newborns with birth asphyxia. The predictor variables were fitted into the regression models at three levels: Level 1 assessed only measures of newborns parameters, level 2 added maternal parameters, while level 3 included obstetric parameters to the model. The measure of association between the predictor and outcome variables were presented as risk ratios (RRs) and 95% confidence intervals (95% CIs). Data were analyzed using IBM® SPSS version 22 (SPSS Inc., Chicago, IL, USA) and respondents with grossly missing information were excluded from data analysis. Statistical significance was set at P < 0.05. Ethical clearance was obtained from the ESUTH Ethics Committee. Informed consent was obtained from every mother-newborn dyad before recruitment. Participation in the study was entirely voluntary, and no financial inducement whatsoever was involved. Voluntary withdrawal at any stage of interaction was guaranteed for all participants without any adverse effect for the mother and/or the baby. All information was handled with strict confidentiality. Two thousand four hundred and fifty newborns were admitted into the NICU of the ESUTH during the study period. One hundred and eighty were managed for birth asphyxia and majority (67.9%) presented at SANART Stage 2 while the remainder presented at Stage 1 (13%) and Stage 3 (19.1%). One hundred and fifty-nine (88.3%) of the 180 newborns were term and male-female ratio was approximately 2:1. The mean age at presentation was 1.51 ± 1.59 days with 19.4% presenting at <24 h, 53.9% at 24—72 h, and 26.7% presenting at >72 h after birth. Most (71.6%) of the newborns had normal birth weights (2.5-—4.0 kg), roughly one-fifth (21.6%) were low birth weight babies (<2.5 kg), while 12 (6.8%) had weight >4 kg. The mean weight of enrolled newborns was 3.05 ± 0.67 kg. 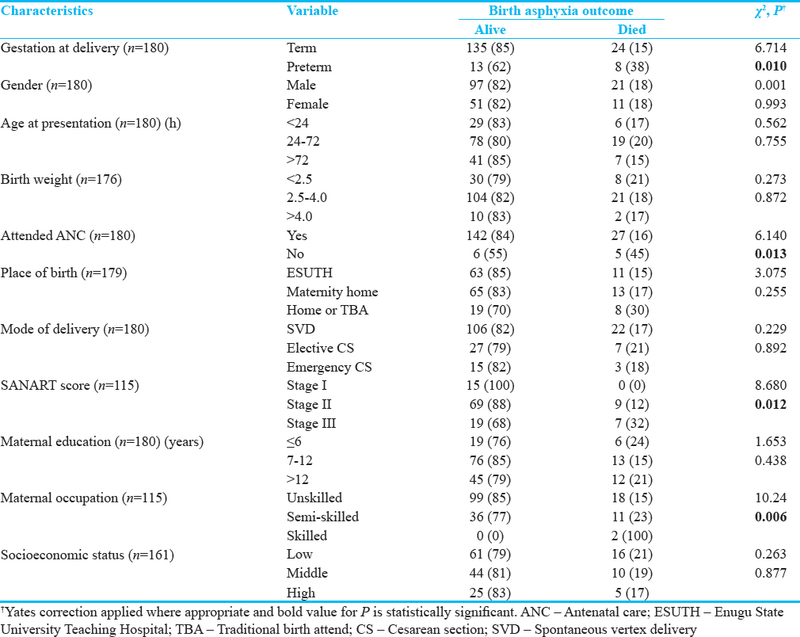 Other socio-demographic characteristics of the newborns admitted for birth asphyxia during the study period are shown in [Table 2]. Thirty-two (17.8%) of the 180 newborns with birth asphyxia died while still on admission in the NICU. There was no significant difference in mean age at presentation (1.49 ± 1.52 vs. 1.38 ± 1.42 days, P = 0.681) and birth weight (3.08 ± 0.65 vs. 2.91 ± 0.75 kg, P = 0.197) between newborns who survived and those who did not [Table 3]. Of the socio-demographic characteristics assessed, only gestational age at birth, uptake of ANC services, SANART score at presentation (P = 0.012), and maternal occupation (P = 0.006) were significantly associated with management outcome of newborns admitted for birth asphyxia. It was noted that significantly more preterm (38%) compared to term newborns (15%) admitted for birth asphyxia died (P = 0.010), while 45% of newborns whose mother did not receive ANC services died compared to 16% of newborns whose mothers received such services (P = 0.013). Further stratification by asphyxiation score at presentation showed that 0%, 11.5%, and 31.8% of the newborns who presented at SANART Stages 1, 2, and 3, respectively, died while still on admission (P = 0.012) and newborns whose mothers were engaged in unskilled occupation had the least proportion of fatality (15%) versus those in other occupational categories (semi-skilled 23% vs. skilled 100%, P = 0.006) [Table 4]. [Table 5] shows a multi-level regression analysis of the socio-demographic characteristics and the management outcome in surveyed newborns. In the first level, newborns characteristics were fitted into the regression model, and only gestational age at birth significantly predicted outcome. Newborns delivered before 37 completed weeks (i.e., preterm) were approximately 5 times more likely to die from birth asphyxia compared to those that were delivered at term (RR 4.99, 95% CI 1.29—19.31). In the second level, maternal parameters were introduced into the regression model. No maternal parameters considered significantly predicted management outcome and in addition, gestational age at delivery lost significance when these maternal parameters were adjusted for (RR 3.09, 95% CI 0.70—13.57). In the third level, when obstetric factors were fitted into the regression model, the place newborns where delivered and asphyxiation score at admission were the only significant predictors of management outcome in the admitted newborns. Newborns whose mothers had ANC in ESUTH (RR 0.01, 95% CI 0.001—0.714) or outside medical facilities (RR 0.04, 95% CI 0.001—3.085) had 0.01 and 0.04 less risk of dying from birth asphyxia compared to newborns whose mother had no formal ANC services. Similarly, newborns born in maternity homes and those born at home (or TBA centers) had roughly 156 and 223 times more risk of dying compared to those born at the ESUTH ([RR 156.4, 95% CI 2.19—171.8] and [RR 223.3, 95% CI 2.07—240.5] respectively). Newborns who presented to the NICU at SANART Stage II had 0.08 less likelihood of dying compared to those who were admitted at SANART Stage III (RR 0.08, 95% CI 0.01—0.72). 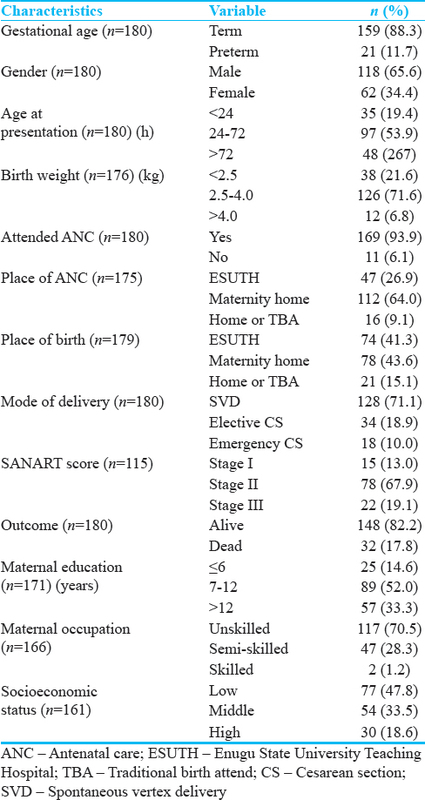 In other words, newborns admitted with asphyxiation score at SANART Stage III were 12.5 times more at risk of dying compared to those admitted with a SANART Stage II score. Finally, maternal occupation that was originally not predictive became a significant predictor of management outcome in asphyxiated babies after the obstetric factors were controlled. Newborns of mothers with semi-skilled occupation had nearly nine times more risk of dying from birth asphyxia compared to newborns whose mothers were in the unskilled occupation category (RR 8.85, 95% CI 1.10—71.47) while gestational age at delivery remained insignificant after the third-level variables were fitted into the model (RR 3.38, 95% CI 0.06—19.12). One hundred and eighty newborns were admitted for birth asphyxia of the 2450 newborns admitted to the neonatal unit during the study period giving an in-hospital incidence rate of 73.5 (95% CI 63.1—84.2) per 1000 admitted newborns. Mild, moderate, and severe asphyxia accounted for 13%, 67.9%, and 19.1% of these incident cases respectively. Prolonged labor was responsible for nearly half (45.6%) of the causes of birth asphyxia. Some of the factors that led to prolonged labor in mothers of the asphyxiated newborns included breech presentation, inadequate pelvis, poor maternal effort, and twin deliveries. Other encountered causes of birth asphyxia in this study included obstructed labor (10.4%), prematurity (8.0%), postdate (6.4%), intrauterine growth retardation (4.0%), and eclampsia (3.2%). 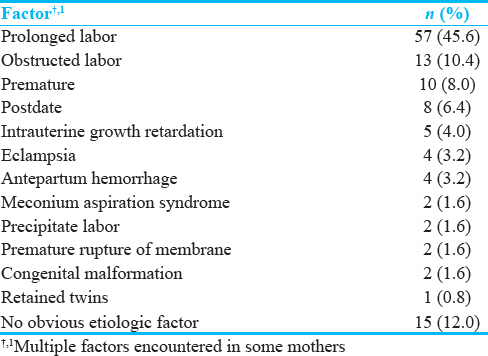 No apparent etiologic factor was seen in 12% of mothers whose babies were admitted for birth asphyxia after routine clinical, laboratory and radiological evaluations were conducted [Table 6]. This study found a high incidence of birth asphyxia in our setting compared to incidence rate in developed clime and even in some developing settings.,,, The higher incidence rates recorded in our study compared to those in other developing settings cited above may be due to several reasons. First, this study was longitudinal as opposed to the retrospective study design conducted in the referenced studies. Second, our study reported incidence rate per 1000 admitted newborns meaning that some of the surveyed newborns were not delivered within ESUTH but referred to it. This is unlike the cited studies where newborns surveyed were delivered within the study setting, thus reporting incidence rates per 1000 live births. Finally, we used the SANART Scoring System to assess asphyxiation in neonates admitted for birth asphyxia different from cited studies that used the APGAR Scoring System. The former has been shown to have better reliability than the latter. Notwithstanding the wide differences noted within these developing settings, the incidence rate in these settings remains relatively and unacceptably high compared to those in developed countries. This arguably is reflective of the inaccessibility and poor state of maternal and child healthcare services in Nigeria and most developing countries. This assertion is buttressed by the United Nations which reported in 2009 that mothers in developing countries are 300 times more likely to die during childbirth compared to those in developed countries. Our study also reported some neonatal, maternal, and obstetric factors that are predictive of mortality in newborns with birth asphyxia. 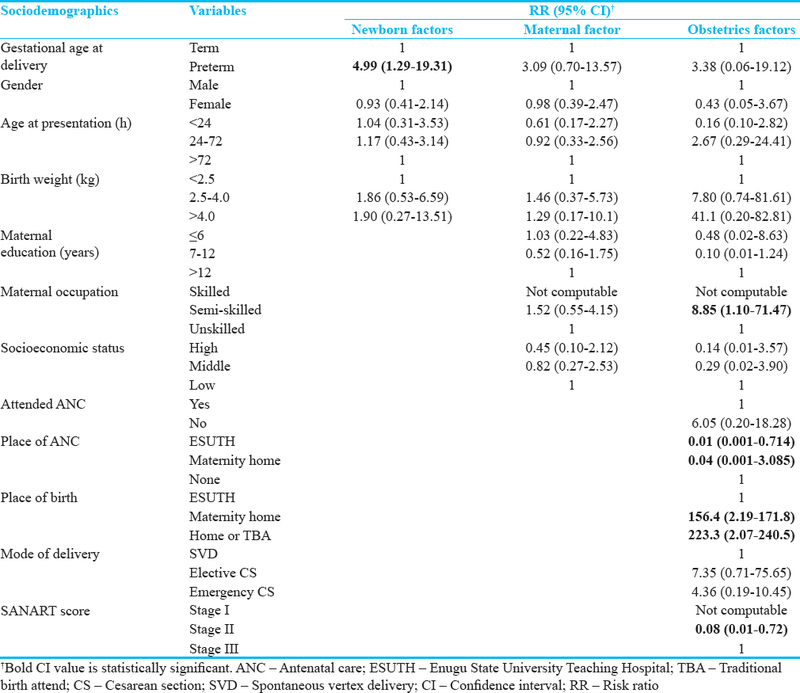 These factors that include prematurity, place of ANC services, place of birth, and SANART staging on presentation have been documented in various studies in developing countries., However, no other study has reported maternal occupation as a predictive factor in outcome in neonates with birth asphyxia. The reason for this finding is not immediately clear. We however speculate that because pregnant women in the unskilled job engage in more demanding activities that involve relatively higher amount of manual labor and/or mobility which may lead to higher and longer exposure of their fetuses to serum corticosteroid, a predominantly stress-induced hormone. This exposure could, in turn, possibly lead to a quicker lung maturation process in these fetuses enabling them to cope better especially to stressful extrauterine circumstances, such as seen during birth asphyxia. A study in Southern Nepal reported a lower risk of dying from birth asphyxia in newborns whose mothers were farmers compared to newborns whose mothers were homemakers (RR 0.47, 95% CI 0.25—0.88); this association, however, lost significance after other factors considered in the study were adjusted for. Contrary to our findings, the same study in Southern Nepal found a twice increase in the risk of dying from birth asphyxia in newborns whose birth was attended by a doctor or midwives compared to newborns with unattended births. This study reports a high incidence rate of 73.5 per 1000 admitted newborns and a case fatality rate of 17.8% of birth asphyxia in our setting. We also reported that gestational age at birth, maternal occupation, place of birth, and asphyxiation score at presentation were significant predictors of mortality in asphyxiated newborns in our setting. Prolonged labor and prematurity were the most common maternal and newborn factors encountered in asphyxiated neonates in this setting. Lawn JE, Manandhar A, Haws RA, Darmstadt GL. Reducing one million child deaths from birth asphyxia — A survey of health systems gaps and priorities. Health Res Policy Syst 2007;5:4. Hyder AA, Wali SA, McGuckin J. The burden of disease from neonatal mortality: A review of South Asia and sub-Saharan Africa. BJOG 2003;110:894-901. World Health Organization. World Health Report 2005. Available from: http://www.who.int/whr/2005/en/. [Last accessed on 2018 Mar 03]. World Health Organization. The World Health Report 2003 — Shaping the Future. World Health Organization; 2003. Ekwochi U, Asinobi NI, Osuorah CD, Ndu IK, Ifediora C, Amadi OF, et al. Incidence and predictors of mortality among newborns with perinatal asphyxia: A 4-year prospective study of newborns delivered in health care facilities in Enugu, South-East Nigeria. Clin Med Insights Pediatr 2017;11:1179556517746646. Olusanya O, Okpere E, Ezimokhai M. The importance of social class in voluntary fertility control in a developing country. West Afr J Med 1985;4:205-11. Thornberg E, Thiringer K, Odeback A, Milsom I. Birth asphyxia: Incidence, clinical course and outcome in a Swedish population. Acta Paediatr 1995;84:927-32. Airede AI. Birth asphyxia and hypoxic-ischaemic encephalopathy: Incidence and severity. Ann Trop Paediatr 1991;11:331-5. Halloran DR, McClure E, Chakraborty H, Chomba E, Wright LL, Carlo WA, et al. Birth asphyxia survivors in a developing country. J Perinatol 2009;29:243-9. Ilah BG, Aminu MS, Musa A, Adelakun MB, Adeniji AO, Kolawole T. Prevalence and risk factors for perinatal asphyxia as seen at a specialist hospital in Gusau, Nigeria. Sub Saharan Afr J Med 2015;2:64-9. Ugwu GI, Abedi HO, Ugwu EN. Incidence of birth asphyxia as seen in central hospital and GN children's clinic both in Warri Niger Delta of Nigeria: An eight year retrospective review. Glob J Health Sci 2012;4:140-6. Spector JM, Daga S. Preventing those so-called stillbirths. Bull World Health Organ 2008;86:315-6. Boseley S. Women in Developing Countries 300 Times more Likely to die During Childbirth. United Nations Report; 2009. Lee AC, Mullany LC, Tielsch JM, Katz J, Khatry SK, LeClerq SC, et al. Risk factors for neonatal mortality due to birth asphyxia in Southern Nepal: A prospective, community-based cohort study. Pediatrics 2008;121:e1381-90. Adebami OJ. Maternal and fetal determinants of mortality in babies with birth asphyxia at Osogbo, Southwestern Nigeria. Global Adv Res J Med Med Sci 2015;4:270-6. Lee AC. Risk Factors for Birth Asphyxia Mortality in a Community-Based Setting in Southern Nepal. Master of Public Health Dissertation, Johns Hopkins School of Public Health; 2007. Ibrahim MH, Asmaa MN. Perinatal factors preceding neonatal hypoxic-ischemic encephalopathy in El-Minia locality. Gynecol Obstet (Sunnyvale) 2016;6:403. Aslam HM, Saleem S, Afzal R, Iqbal U, Saleem SM, Shaikh MW, et al. Risk factors of birth asphyxia. Ital J Pediatr 2014;40:94. Hall DR, Smith M, Smith J. Maternal factors contributing to asphyxia neonatorum. J Trop Pediatr 1996;42:192-5.